Back in 2015 my kids' fabulous grandmother took us to a little building in a parking lot. 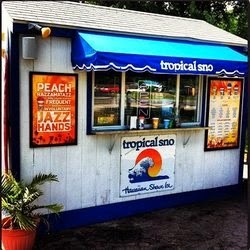 It was called Tropical Sno. My mom fell in love with shave ice in Hawaii when she would go with my dad every year. I got to go with them to Hawaii one year when I was "in between situations" (memoir to come, haha) and remember it tasting like summer. You can pick up to 3 flavors in your shave ice and it is YUM! You can also make it meatier by putting some ice cream in the bottom of it for your shave ice and flavorings to run into. $15 for 5 of us to have 5 small shave ices … so about $3 for a small. If you are in Kansas City, check out this local business this summer! Do you have a shave ice establishment in your town?